This customizable product is in the post and will be arriving in Henderson within a few days. I had high hopes when I spotted this and tried it out at CES 2012. It combined a number of items that you might have to cobble together if you were going to make your laptop act more like a desktop setup, particularly in the area of the monitor positioning. What have I learned during the week that I have had this review unit? The keys type predictably. They were similar is size to the keys on my MacBook and most of the layout was similar as well. For blogging and mostly text-editing, this is more than usable. The touchpad is serviceable, despite being 1/4 of the size of the Trackpad on my MacBook. Because the touchpad was more like the standard touchpads on non-Macs, I had to adjust my movements to a more “mouse-like” setup. The three fans were quiet. I had to turn the unit around after connecting the USB plug that provides power to them to make sure they were indeed working. They were. The setup appeared to be stable enough that I didn’t worry about the computer flipping back or collapsing under the weight of the laptop. While not made of the heavier metal of other products, the ABS plastic seemed to be suitably sturdy. One of the end caps and the pole that serves as the spine for the RTA-SISK31’s hinge where separated from the unit when I unpackaged the unit. Hmmm. The touchpad, due to its limited real estate (compared to the TrackPad or to the motion area of a separate mouse), wasn’t as easy to use for more fine-movement like photo editing and painting. The compartment that serves as the storage for the USB connector that provides power to the fans is difficult to prepare for “putting away”. It is a tight fit and I spent no less than 10 minutes trying to figure out how to curl the cord carefully in the recessed compartment so that the trapdoor/cover would rest “flush” with the rest of the backing. The micro-USB connector that connects the built-in keyboard/touchpad is not at all secure. A cord does not fully enter the port and easily popped out. When I was adjusting the position of the MacBook on the stand, the provided cable easily slipped out of the port, causing my MacBook to give this awful error about ejecting drives improperly. Luckily I didn’t really lose any data. This is not good. The leaning angle is just OK for someone of my stature (I am just over 5 foot 7 inches). With the MacBook open all the way and the stand in its “furthest” position for leaning, the screen was just OK for reading. In the accompanying use video, note the angle of the MacBook screen. When my partner, who is 6 foot 4 inches, sat with the same set up, he had to physically pickup and tip back the entire assembly to angle the view to his comfort level. I visited my nearest Apple store and looked at the packages of MacBook- and MacBook Pro-compatible stands. These raise the entire laptop about six inches but slightly angle forward, so just a monitor stand wouldn’t be the same. This places the monitor at a similar height as with the RTA-SISK31 but the angle is more in a usable range between my height and my partner’s height. When I use a separate powered USB hub and don’t rely on the micro-USB port to do more than connect to the keyboard/touchpad on the unit, I can use the stand without worrying about the inadvertent disconnection of my storage devices. The RTA-SISK31, sold by Amazon.com and others for around $75.00 is useful but has some feature concerns that need to be addressed for it to be a real killer accessory. It did what was supposed to do: I was able to comfortably type and “mouse” through the creation of a blog posting with my USB drive available. While the angle wasn’t absolutely perfect, I didn’t have the same crick in my neck I normally get when I am hunched over the book when it rests directly on the table or desk at the usually height. Other computers may have more tilt range for the angle of the LCD display but the MacBook was just at an angle that taller users may find this to be a difficulty, particularly if they use correct lenses which already limit the angle of reading. The fans did keep the computer cool and did so quietly. The battery didn’t experience a precipitous drop in power because of the use of power. Even though it is not made of premium elements, the pieces that are present should be well-constructed. As I experienced it, I would give The Sharper Image Cooling Stand with built-in keyboard, the RTA-SISK31, a B. The review is coming later, but this is the unpackaging and overview of the unit. Posted on January 25, 2012 by Rex Suba-Anderson Posted in Accessories make the traveler, Normal Computing, Tablets, e-readers, media players, oh my! Arriving yesterday was a box containing the RTA-SISK31, the cooling stand with built-in keyboard bearing The Sharper Image name. I will start my blog postings series about this stand with either a video or a series of still images (slideshow) showing the unpacking of the unit. In the weekend, I will be do the initial setup with my MacBook and the more intensive “how does it work” follow-up into Monday. Posted on January 22, 2012 by Rex Suba-Anderson Posted in Accessories make the traveler, General Site News, Normal Computing, Tablets, e-readers, media players, oh my! I think the newest non-new item I encountered at CES 2012 was this keyboard cover for my Apple wireless keyboard. Since I acquired the Incase Origami Workstation case for the keyboard, it was obvious that any overlay had to be very slim. As I am a decent touch typist, it isn’t always necessary to see the labels on most keyboards’ keys. There is a lack of contrast that often makes it difficult for me to read the keys on these slim Apple keyboards. The KB Cover for Large Type is available for various formats, including the larger wired Apple keyboards. It was most fortuitous that KB Covers had a booth at CES and could sell the keyboard covers on the floor and still had what I wanted on hand. The cover is pleasant to type on and without my reading glasses, I am comfortable typing on my iPad and still being able to see all of the keys’ labels clearly. Even the icons for the additional functions on the functions keys are enhanced for easy deciphering. So, realistically, what out of the various CES 2012 gear would I actually buy? Posted on January 19, 2012 by Rex Suba-Anderson Posted in Accessories make the traveler, Fashion Forward, General Site News, Moving Pictures, Phones – Smart and not, Tablets, e-readers, media players, oh my! The slideshow(s) and the videos should give some indication of what I was even interested in remembering from this year’s show which, despite the crowds, seemed low key compared to previous years. Well, one item I bought in the exhibit hall. The large text cover for my Apple wireless keyboard from kbcovers.com. I love it. Because it is so thin, I can keep it with my keyboard while it lives in its relatively new Incase Origami Workstation case. M-Edge has some things that are new in their line of products that I will investigate for reviewing. I’m so glad that the Nook Tablet is the same size as my Nook Color so those will some choices I will make for review ideas. There were even more cases, sleeves and accessories for tablets and e-readers from which to choose at this year’s CES. The 360° panoramic video created with the Kogeto dot literally caught my eye. A snap-on lens accessory for the iPhone 4/4S, you can record video in a full 360° view. My colleague, Alice Swift, was also at CES and reported that they had their own software but I don’t remember if it’s required for use or an option. The various point-and-shoot cameras are so far beyond my three (two Sonys and one Kodak), I was drooling. Sure, the DSLRs are always awe-inspiring but realistically, I survive with my pocketable cameras. Panasonic, Canon, Casio and even Vivitar and Polaroid (with a camera that’s also an Android phone) had models that I played with for a bit of time. Don’t be surprised if I have a new one by the end of the calendar year. I was really interested in Polaroid and Panasonic digital camcorders (see the end of Vimeo video from the January 16 post with my demo of the Panasonic) for the budget traveler. So much has changed since I bought the Kodak Zi6 three years ago. Remember the TyPillow from last year’s CES? I was so enamored with this item, I even asked its creator to take my picture with it. When it was eventually announced, it was after the release of the Apple iPad 2 so that was what it was marketed for, to the apparent exclusion of the iPad 1. Now, it is available for the iPad but I have moved on. 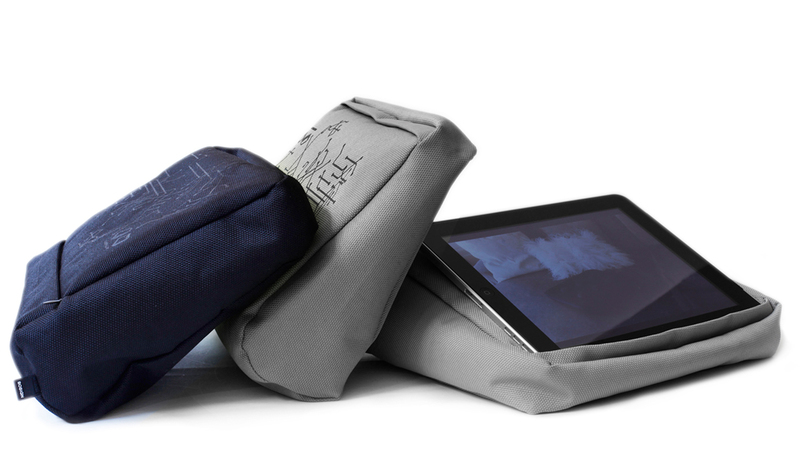 The new soft format carrier/stand/holder of my thoughts is from Bosign of Sweden: the TabletPillow. It has a bit of a lip on which you can rest various types of e-readers and tablets. Because it isn’t form-fitting, your device can be resting/viewed in landscape or in portrait mode. There are two internal pockets: one for your device, one for incidentals or accessories. It has been available for sale in UK but isn’t yet for sale in the U.S. When I get it, you will be the first to know! Some varied motion footage taken with the Sony DSC-TX7 on the exhibit floors at CES 2012. CES 2012: What gear did I travel with? Posted on January 16, 2012 by Rex Suba-Anderson Posted in Accessories make the traveler, Destinations and Departure-Points, General Site News, Phones – Smart and not, Tablets, e-readers, media players, oh my! It was fairly easy to decide what I was going to take with me for the two afternoons I could go to CES 2012. To support my iPad 1, I had my Targus bag, my Apple Wireless keyboard in its incase Origami case. Additionally, I brought along the SD card reader that was part of the Camera Connector kit. My primary show floor camera was my handy Sony DSC-TX7, supported by a Lenmar battery. With this camera, I shot both 16:9-formatted still images plus AVCHD video. Storage for this was a 16-gig Delkin SDHC card (note: the case of the card is on the verge of completely splitting, so this is probably the last major project for which it will be used). The Kodak Z915 was my backup still camera, with power provided by Rayovac rechargeable AA batteries. As my video for my moving image footage, taken with my Sony DSC-TX7, is uploading to Vimeo, I am resting my still aching legs. So much walking then I had to walk about half a mile to where my car was parked each evening I was CES. CES 2012. Over for another year. Posted on January 13, 2012 by Rex Suba-Anderson Posted in Accessories make the traveler, Destinations and Departure-Points, Moving Pictures, Tablets, e-readers, media players, oh my! Now my hard work really begins. While you await my posts, click on the thumbnail below to proceed to my set of CES 2012 photos on Flickr or click the image below for a Floatbox slideshow. Thank you to all the friendly vendors and staff at the various booths and pavilions for taking my information so that I can share it with all of you. Thank you in particular to Lenmar: their battery for my Sony DSC-TX7 point-and-shoot camera lasted through almost 175 shots and 20+ 720p videos. No small feat as I used its Anti-Motion Blur Mode so that I didn’t have to use my flash. Will have separate posts for the various vendors of mobile-friendly gear I want to highlight from this year’s CES 2012. A video compilation will be available at the end or after the weekend. Now I need to soak my poor feet and take some Advil! Goodnight!